My BrainPOP district administrators can view and manage My BrainPOP educator accounts in the Admin Dashboard. Log into your My BrainPOP admin account and click Admin Dashboard. From the Admin Dashboard, click Educators. Choosing the educator you would like to edit will bring up their profile. You can also designate this educator as an admin on the school account by checking the box that says School admin. You cannot edit educator usernames or passwords. NOTE: If you have existing accounts and they appear in your CSV, we will update them with the information on your file. If there is no match in our system, a new account will be created. Click Export CSV to download a CSV of your existing educator accounts. The download should begin automatically. Open the downloaded CSV file and update the fields for the educators you wish to change and save the file. NOTE: Do not delete or rename any columns or headers. Keep them exactly as they appear in the exported CSV. Username This should be a unique username within all of BrainPOP, not just within your school or district. Usernames can contain letters, numbers, periods, dashes, underscores, and @. We suggest adding something unique like your school name or mascot to every username. For example, the username for Marcus Garcia might be mgarcia_scottsdale. Email The educator’s email address, which must be unique within all of BrainPOP. Educator ID A unique ID within your district. We suggest using a persistent identifier you use year to year. If you use a Student Information System, this could be your teacher’s unique ID in that system. Is_educator_admin? This field can be blank, or you can write ‘yes’. Choose ‘yes’ to designate an educator to become an administrator. NOTE: You should retain the CSV file format. If you’re using Google Sheets or Microsoft Excel, be sure to export as a .CSV file, and not an .XLS file. Return to the Admin Dashboard and click + Add Educators. Click Multiple Accounts (Via CSV). Upload the CSV by dragging and dropping into the provided field or by clicking Browse and selecting the completed CSV. If any data is missing, duplicated, or improperly formatted, then you will see a summary of errors. Choose Download CSV to Fix and open the CSV. You will see a new column added to your CSV with errors noted. Username is already taken within BrainPOP. Choose a new username. Try adding your school name or mascot to the end of the existing username. Username contains restricted characters. Usernames can contain letters, numbers, periods, dashes, underscores, pluses, and @. Usernames cannot be changed for existing educators. Admins cannot change the usernames of other educators. Required field is missing (educator_id). All teachers must have a unique educator ID. Educator ID belongs to another educator in your school or district. Educator ID must be unique within your school or district. School subscription is expired. You can only create accounts in schools with unexpired subscriptions. Unrecognized value (is_educator_admin). If an educator is an admin, fill in "yes". Otherwise, leave blank. Fix the errors to prepare the CSV for re-upload. NOTE: Don’t forget to delete the errors column before you re-upload your CSV. Click Return to Upload to upload the CSV. Choose Next. 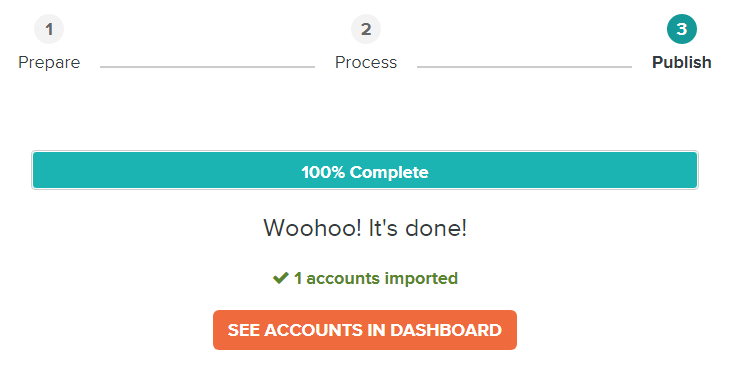 For accounts with no errors, click Woo hoo! Import Accounts to continue. You will be notified of any errors, and you will have the option to edit the CSV file or upload the accounts that don’t have errors. Start Over With Extra Help: This will cancel the import and no accounts will be created or updated. You'll be able to download your original CSV with errors noted in a separate column. You can address the errors in this CSV and re-upload. Import What We Can - Fix Others Later: This will continue importing only the valid accounts that have no errors. You'll be able to download a smaller CSV of just the invalid accounts with errors noted in a separate column. You can address the errors in this CSV and re-upload. NOTE: Delete the errors column before you re-upload your CSV. If you choose to Import What We Can - Fix Others Later, you will advance to a screen that allows you to download the accounts with errors and then import the accounts without errors to the dashboard. Click Download to get a CSV of your errors to fix later. Then click Next: Import. After importing, it may take a little bit of time to upload all the accounts. You may leave the page or close the window completely at any time and the accounts will continue to upload. The progress of a CSV upload can be accessed by clicking CSV Log. An email confirmation will be sent when the upload is finished. Admins can check the CSV Log to see the status of their upload (waiting, in progress, completed). Though rare, there may be additional errors in the publishing process. In this instance, the CSV Log will provide a download link to another CSV. Once uploaded, click See Accounts in Dashboard to view. After importing, it may take a little bit of time to upload all the accounts. You may leave the page or close the window at any time and the accounts will continue to upload. The progress of a CSV upload can be accessed by clicking CSV Log. An email confirmation will be sent when the upload is finished. Choose the educator whose password you would like to reset. Click Reset Password. You will see this prompt: Would you like us to send an email to this educator with directions on how to reset his or her password? Click OK. An email with instructions on how to reset the educator’s password will be sent to the teacher’s email address. NOTE: Administrators cannot edit educators’ usernames. You can remove a single educator from your school, or you can remove multiple educators at one time. Unlinking an educator account removes it from your school and from your control as an administrator. Unlinking deletes all the educator’s classes, though it will not delete any mixed quizzes or assignments they have created. The educator’s account will no longer have access to the school's subscription. Educators can relink their accounts to an active school subscription if they are invited to join the school via the Admin Dashboard, or if they are given the school's educator code. Tick the box next to the educator account that you would like to remove. Select Remove, then confirm by clicking Remove. Tick the boxes next to all of the educator accounts that you would like to remove. As a My BrainPOP district administrator, you can revoke other administrators’ privileges. Revoking administrators’ privileges removes access to the Admin Dashboard for the administrator. 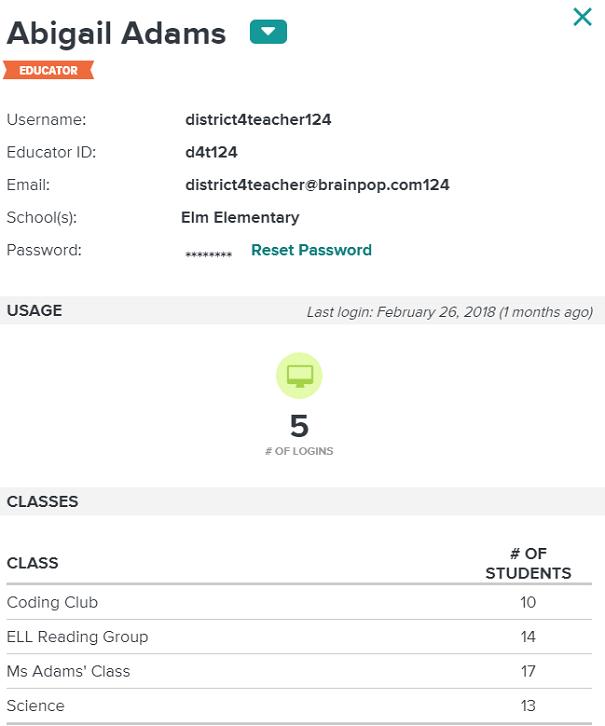 They will retain My BrainPOP educator access, but they will no longer be able to view usage data, subscription information, or create or manage other My BrainPOP accounts in the school. From the Admin Dashboard, click School Info. Click the trash can icon next to the administrator(s) that you would like to remove. If the administrator has left your school, you have the option to remove the administrator from your school entirely. Choose Remove Educator from the menu. This will completely remove the account from your school in addition to removing the administrator privileges. Otherwise, click Remove Admin Access to keep the educator at the school. What if a teacher does not receive the educator password reminder? 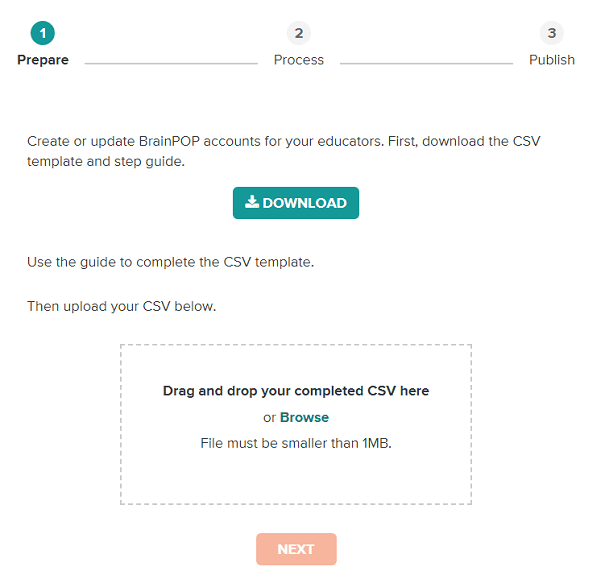 See our article on Issues Receiving BrainPOP Emails. Can I change My BrainPOP educator account usernames? No. Educators can Contact Us to change their usernames. If I remove an educator from my school in error, how can I add them to my school again? In the Admin Dashboard, you can choose + Add Educators and then Does an educator already have an account? This will allow you to send an email inviting the teacher to join the school. If I accidentally removed all my teachers, is there a way to upload them again via CSV? Yes. You can relink your teachers to the school by uploading a CSV.